Dorna Sports is delighted to announce that Thai company PTT will title sponsor the Thailand GP in 2018, naming the exciting inaugural race weekend – set for the 5th to 7th October 2018 – the PTT Thailand Grand Prix. 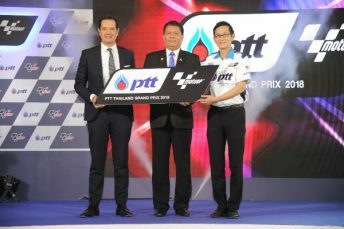 PTT is a state-owned energy giant present throughout Thailand and one of the biggest companies within the Kingdom – making its partnership with MotoGP™ as title sponsor even more valuable as the world’s fastest motorcycle racing Championship prepares to go racing in the nation for the first time. PTT’s presence as title sponsor is an important display of investment ahead of the first Thailand GP, underpinning the wide-ranging benefits of hosting MotoGP™ once more. MotoGP™ will first visit Buriram for a preseason test in February, before engines fire up for the first racing laps of the track in October.